Tiffany M. Skidmore​ holds degrees in Music Composition and Vocal Performance from Gonzaga University, Eastern Washington University, and the University of Minnesota. She has studied with acclaimed Scottish composer James Dillon, Chaya Czernowin (head of Music Composition at Harvard University), Jonathan Middleton, and J. Kevin Waters. Her work has been featured in the Hildegard von Bingen Festival of Women in the Arts and the Rimon Artist Salon, and performed throughout Europe and the United States by Duo Gelland, the California State University Stanislaus Concert Chorale, Opus7 Vocal Ensemble, The Gregorian Singers, the Kiev Philharmonic, Ensemble Dal Niente, Fonema Consort, and the Strains New Music Ensemble, among many others. She has received commissions and awards from organizations including the Jerome Fund for New Music, the University of Minnesota, Rimon: the Minnesota Jewish Arts Council, and the Schubert Club. 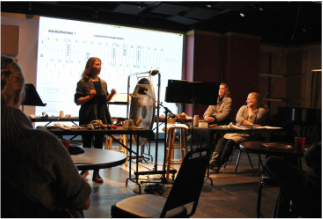 She was selected for participation in the Centrum Composition Program, the Nautilus Composer-Librettist Studio, the John Duffy Institute for New Opera, the 2016 Internationale Ferienkurse for Neue Musik Flute Composition Workshop (with Rebecca Saunders and Eva Furer), and the Zeitgeist Composer Workshop. She is a 2018 McKnight Composer Fellow, a member of the American Composers Forum, and president of the Minneapolis composer collective, 113.